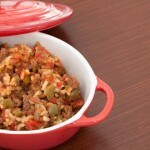 Gluten-free and dairy-free jambalaya casserole. 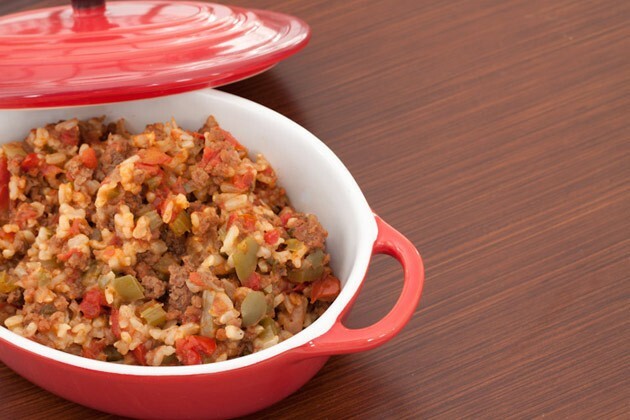 All of the jambalaya flavors melded together in an easy casserole. In a large frying pan, combine coconut oil, bison, onion, and garlic. Cook on medium heat until meat is no longer pink, then stir into casserole dish. Combine all remaining ingredients in a 2.3L casserole dish. Cover and cook for 75-80 minutes, or until rice is cooked and water is absorbed.